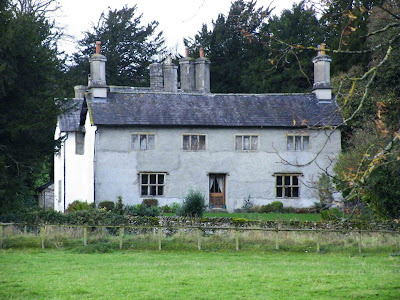 The very ancient house of Helsington Laithes lays at the junction of the A6 and the A591 just South West of Kendal. During the Winter months, the stark white house can be seen clearly from the road travelling North into Kendal on the A6, but is hidden by trees during the Spring and Summer months. The manor of Helsington and the house have, in their long history, been home to local families the Helsingtons, the Stricklands, the de Thwengs and the Bellinghams....all land owning families in the surrounding areas. The earliest parts of the house date from the 15th century, this portion once housing the dairy and scullery. It is this part of the building that possibly represents the remains of a solar tower, long since changed, rebuilt and remodelled over the years. This part of Helsington is situated beyond the wing shown in the photo below, to the East of the site. It is a three storeyed wing with a gabled roof, measuring some eight by six metres over walls some 1.3 metres thick. The West walls of this wing however, are a massive 2.4 metres thick.....somewhat thicker than most simple domestic houses of this era. The Northern wall of this wing is slightly thinner than the West, South and East walls, possibly indicating that it was once an internal wall, and that part of the building was demolished at some point. The photo, above, shows the 16th century cross wing looking from the East. The rest of the site consists of a 16th century kitchen block to the East of the early part of the building, together with a 16th century hall further to the East, and the 16th century cross wing shown above. There are also 18th century additions to the North and the South...not shown here. Above. The West wing and the central hall. It is thought that there was a hall on this site from as early as the 13th century, although it's unlikely that anything survives of this building. Check out the link to the Helsington Laithe's web site for details on renting the property and a brief history. We have owned Helsington Laithes Manor for nearly 14 years and have discovered many new items of historical interest from various visitors. This is a useful precis of the history, very well presented.